Posted is ‘The Doodle’, from Sketch Book One, December 2006. This selection is from the +12 portion of the project-Doodles selected by friends. This one was selected by Karen. She selected the ‘doodle’ number One for the three spheres and the shapes surrounding the top area of the spheres. 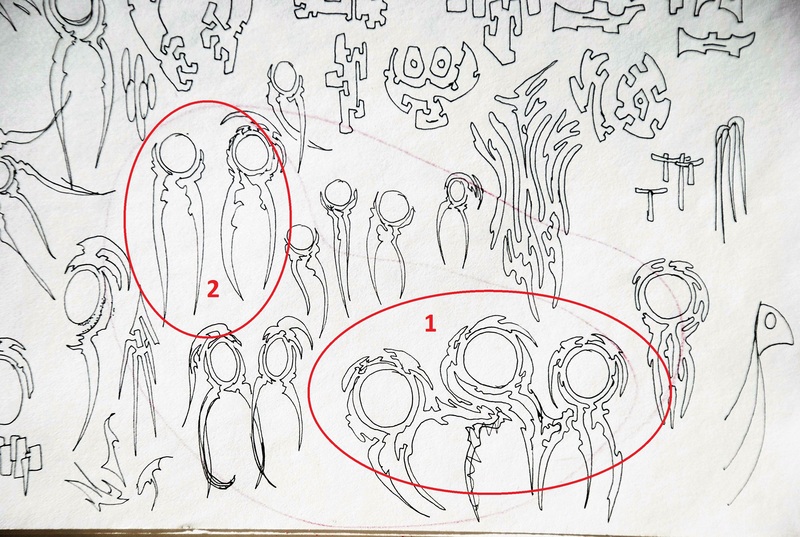 Yet Karen also liked the long downward ‘leg’ shapes in the circled ‘Doodle’ number Two. I decided to incorporate both into the final painting. How I resolved combining the two is on next Monday’s ‘Worksheet’ post. A NOTE: The 12 people I selected for the +12 portion of this project were for several reasons, two are my sons, some, very close friends I have known for years, some, artists I have connected with over the years. Other variables such as time and place played a part with people I knew. There were only 12 selections I could make and there were many people I would like to have included in this project and my hope is that you don’t feel slighted in any way.